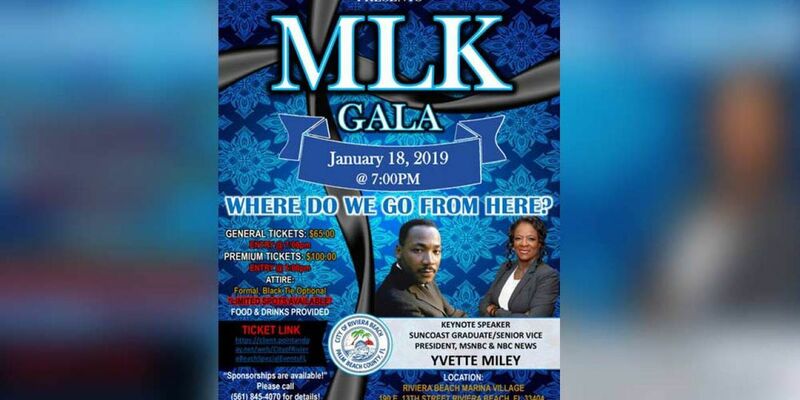 RIVIERA BEACH, Fla. — Riviera Beach is holding a gala Friday night to celebrate the life and legacy of Dr. Martin Luther King Jr.
MSNBC and NBC News Sr. Vice President Yvette Miley, a Suncoast High School graduate, will be the keynote speaker. The gala is Jan. 18 at 7 p.m. at the Riviera Beach Marina Village located 190 E 13th St.
Attire is formal with black tie optional. Food and drink are provided. General tickets cost $65 with premium tickets costing $100. Call the Riviera Beach Parks and Recreation office at 561-845-4070.